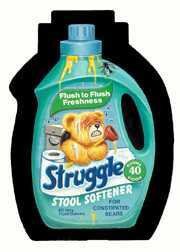 This May, the most successful spoof product ever produced will be in a store near you. First released in 1967, Wacky Packages is set to take on the new millennium with all-new parodies such as "Who Cares Bears? ", "Scrapple", "My Little Phony", "Mean Cuisine", "Chimp Stick" and much more. There are 55 all-new hilarious paintings in all for the re-launch. We even crack on our product. 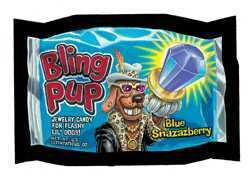 "Ring Pop" is now "Bling Pup". Each box of cards will also feature randomly inserted surprises such as 15 different reusable Clear Cling Vinyl Decals and 10 different Temporary Tattoos. And the fun does not stop with these wacky stickers. There are Crazy Coupons and Puzzle Pieces on sticker backs.